I guess I was a liar. I posted up the "That's All Folks" thinking I was finished up for this sprint. But well... 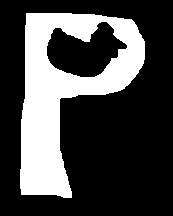 Here I come with the letter P.
The idea behind this one. hit me like a cannon. The last time I stuck a chicken in the hole but why not just have the hole be the chicken. Then a word came to mind. Well, that's not quite true. It's a prefix. Pseudo- This pseudo-chicken was the obvious solution when it came down to it. It's black and white because it's not really there, being just a shadow of a notion. Whether it's the chicken or the P that isn't really there is up to you, but if you ask me both are just notions.